Usually we use the Hoosier State Chronicles blog to tell you stories about Hoosiers and the State of Indiana by using local newspapers. For this project, we are examining world events through the eyes of the Hoosier newspaper reader. 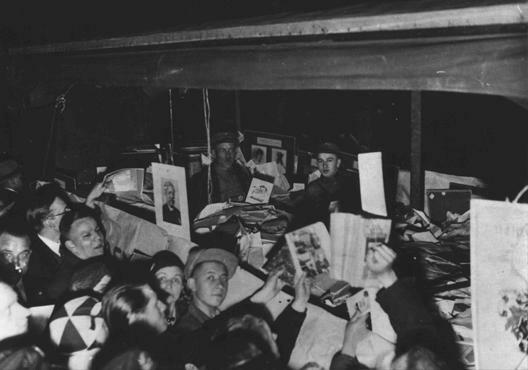 Because many of these articles were reported through the Associated Press and United Press news services, what we are really seeing is not just what Hoosiers knew, but what the average American knew, about the events leading up to the Holocaust. Over the next several months, we will be contributing newspaper articles to the United States Holocaust Memorial Museum‘s project titled History Unfolded: US Newspapers and the Holocaust. Using digitized newspapers mainly accessible via Hoosier State Chronicles, we are looking at key events suggested for research by the museum to see what Hoosiers knew when. 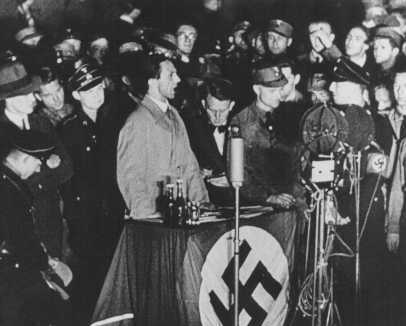 The overall goal of the project is to contribute to the scholarship on how American media reported and under-reported Nazi atrocities. Anyone can submit their research; find out how at History Unfolded. (Greencastle) Daily Banner, January 17, 1933, 1, Hoosier State Chronicles. We did not make the last war. Even if it is accepted that Germany was guilty for plunging the world into the greatest carnage of all time — and we dispute this question of war guilt — we, the younger generation, were not responsible. Why, then, should we suffer the humiliation and indignity of our present situation. This generation, however, would be responsible for much greater carnage. On April 6, 1933, the student association’s propaganda office declared a nation-wide purge of “un-German” literature. 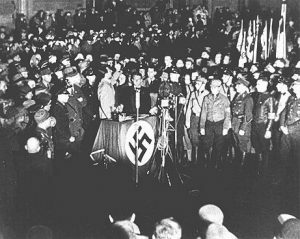 Local chapters of the Nazi German Student Association published articles and lists of blacklisted works, created press releases and radio announcements, and organized book burning events with Nazi speakers. Black listed authors included socialists, communists, and “corrupting foreign influences.” They condemned several American writers including Ernest Hemingway, Jack London, and Indiana author Theodore Dreiser. A Terre Haute native, Dreiser was targeted because of his socialist convictions and because of his role in defending political radicals, many of whom were union leaders that he believed were denied social justice. 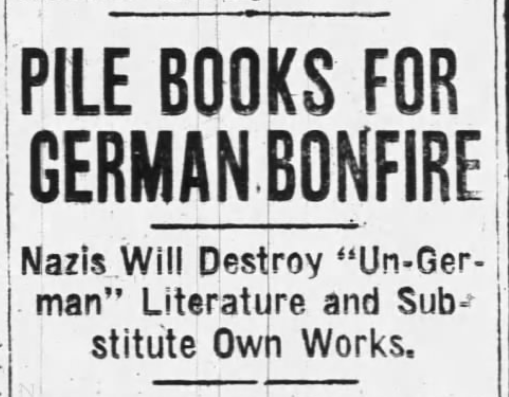 Interestingly, Dreiser’s books were also ordered to be burned for their socialist content in 1935 by the library trustees of Warsaw, Indiana, where he went to high school. 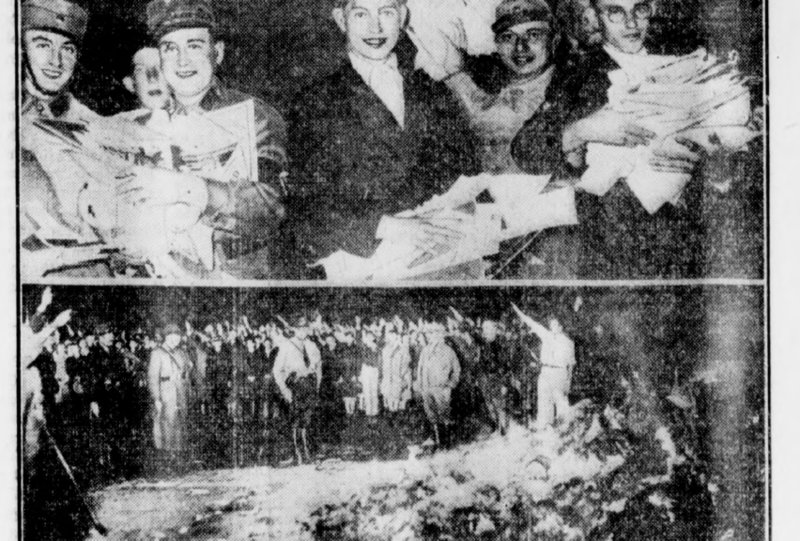 Considering the action of burning books runs counter to American ideas about freedom of the press and speech, we expected to see strong denunciations of the purge in Indiana newspapers. In actuality, we found little. Unfortunately, the (Indianapolis) Jewish Post is not available for most of the year 1933 in Hoosier State Chronicles. On the other hand, most Indiana residents would not have had access to that newspaper. 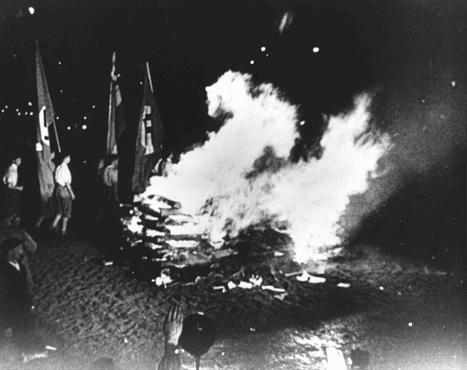 So what did the average Hoosier newspaper reader know about the Nazi-orchestrated book burnings? “Nazi Troops Active,” (Greencastle) Daily Banner, May 2, 1933, 1, Hoosier State Chronicles. Blacklisted books from private as well as public libraries were piled high today on ‘Kultur’s altars’ throughout Germany for public burning tonight. Schoolboys enthusiastically rushed final preparations for the huge bonfires. 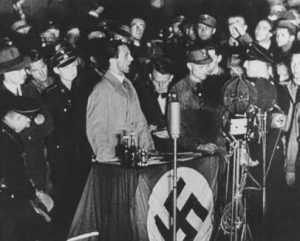 Nazi student committees of action have been working at top speed more than a week arranging for the great purging of the libraries of ‘un-German influences.’ Government recognition is to be lent to the occasion in a rallying speech shortly before midnight by Dr. Joseph Goebbels, Nazi minister of public enlightenment. The weird glow illuminated Opera Square opposite Berlin University as the students, garbed in the picturesque costumes of their fraternities, the Nazi brown or the steel helmet gray, threw a thousand torches on the pyre, then seized the books from trucks and hurled them onto the blaze amid cheers. 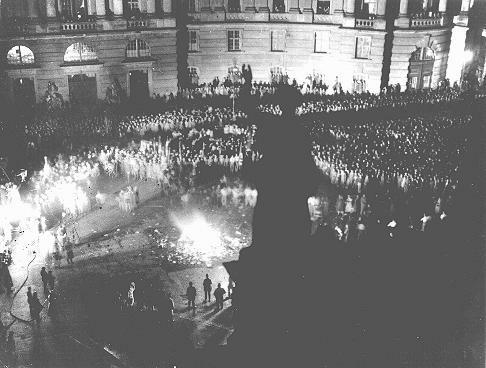 Ten thousand singing and shouting students marched around a blazing bonfire in Opera square until the early hours of today, jubilant at destroying books representing ideas and doctrines considered hostile to Nazi Germany. The UP reported that in addition to books by the authors previously mentioned, the students destroyed All Quiet On The Western Front, a work describing the horrors of the First World War, from which the students were distancing themselves. “Nazi Students in Celebration,” (Greencastle) Daily Banner, May 11, 1933, 1, Hoosier State Chronicles. In the days following the purge, we expected to find editorials condemning the book burning and exalting the American principles of free speech and press. As previously mentioned, our search suffers from lack of access the (Indianapolis) Jewish Post for these dates. However, we were hoping to find a strong statement such as the editorial by the African American newspaper the Indianapolis Recorder condemning the boycott covered in our previous post in this series. However, we found little local response to the event. 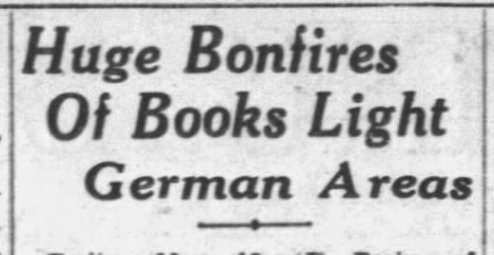 On May 22, the (Greencastle) Daily Banner ran a group of photographs and a caption almost certainly from a wire service (though none is credited) showing images from the book burning. The headline, “Scene at Nazis’ Literary Holocaust,” seems chillingly prescient of the genocide to come. 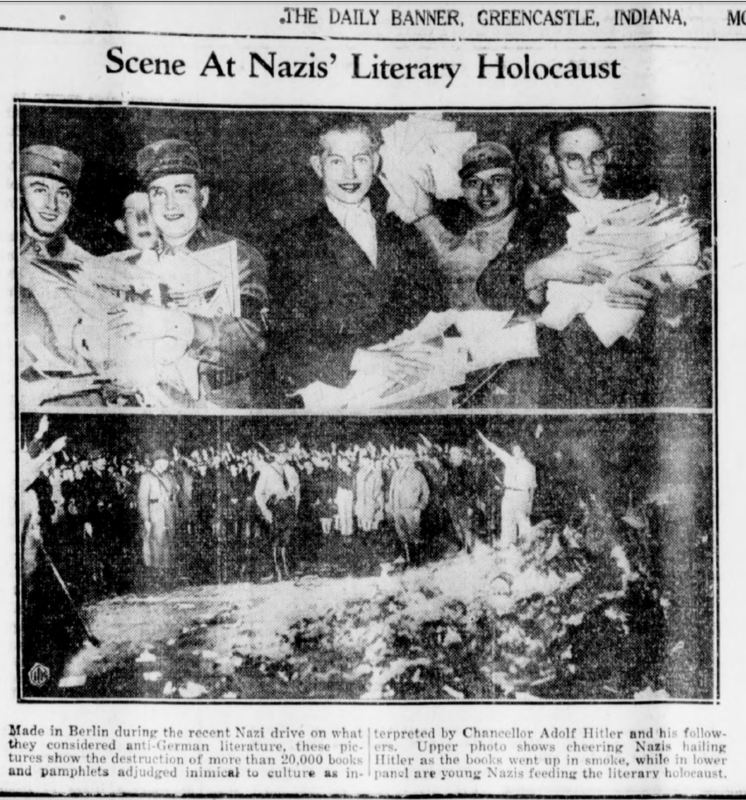 “Scene at Nazis’ Literary Holocaust,” (Greencastle) Daily Banner, May 22, 1933, 3, Hoosier State Chronicles. Made in Berlin during the recent Nazi drive on what they considered anti-German literature, these pictures show the destruction of more than 20,000 books and pamphlets adjudged inimical to culture as interpreted by Chancellor Adolf Hitler and his followers. Upper photo shows cheering Nazis hailing Hitler as the books went up in smoke, while in lower panel are young Nazis feeding the literary Holocaust. 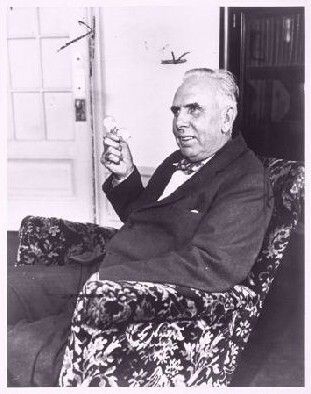 Despite Goebbel’s assertions, the “new” era only grew darker. As German Jewish poet Heinrich Heine wrote in an 1821 play which was among the works burned that night, ” Where they burn books, they will also ultimately burn people.” According to the USHMM, the oppression of culture was just one of many ways in which the Nazis worked to “purify” Germany. The annihilation of the Jewish people would be next. Please visit the United States Holocaust Memorial Museum’s summary of the book burnings for more information, photographs, and the personal stories of Holocaust survivors. Don’t forget that you can also participate in the History Unfolded project. Hoosiers can also learn more about the Holocaust and its survivors through CANDLES Holocaust Museum and Education Center in Terre Haute, Indiana. 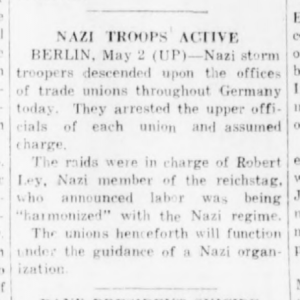 Check back over the next few weeks as we share our research into Indiana newspaper coverage of the Nuremberg Race Laws, the annexation of Austria, and the struggle of Jewish refugees.